I had planned to go kayaking today but I woke up with a headache this morning. 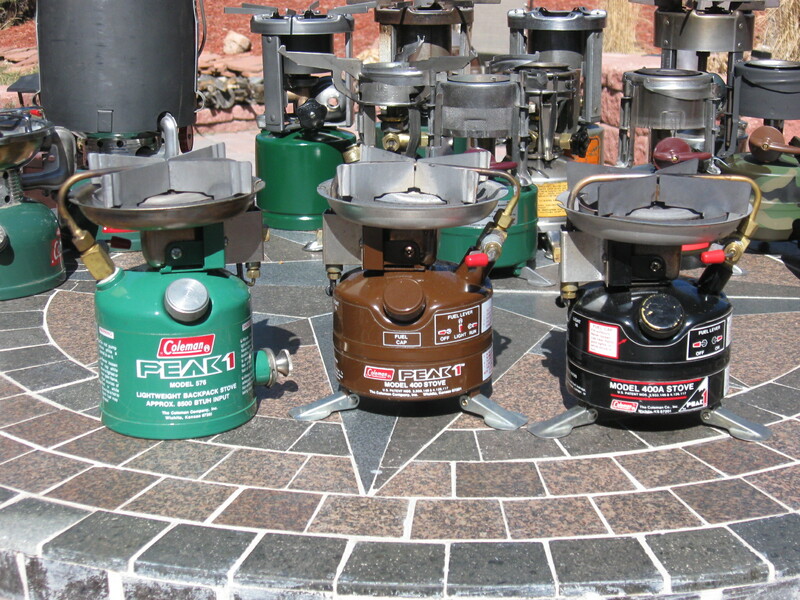 While waiting for it to go away I decided to gather up my stoves up for a photo. I began buying them last summer and worked on them this winter. Today is a 70 degree, sunny mid-March day, so, why not. I will also add that all but one are in functional condition and I’ve been using them on camping and hiking trips. 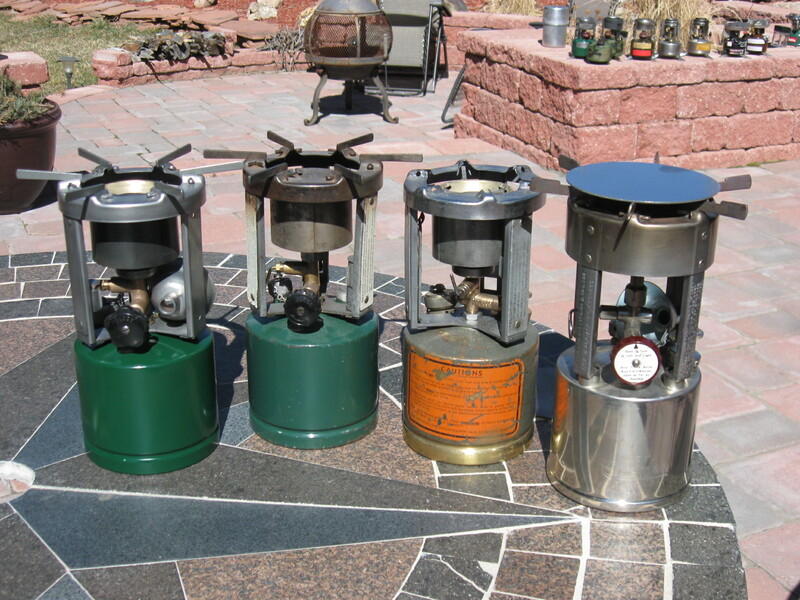 First up are my 1941 American (AGM), two Coleman 520s and 530 stoves. The 1944, brass tank Coleman still needs to be reassembled but the others are complete. 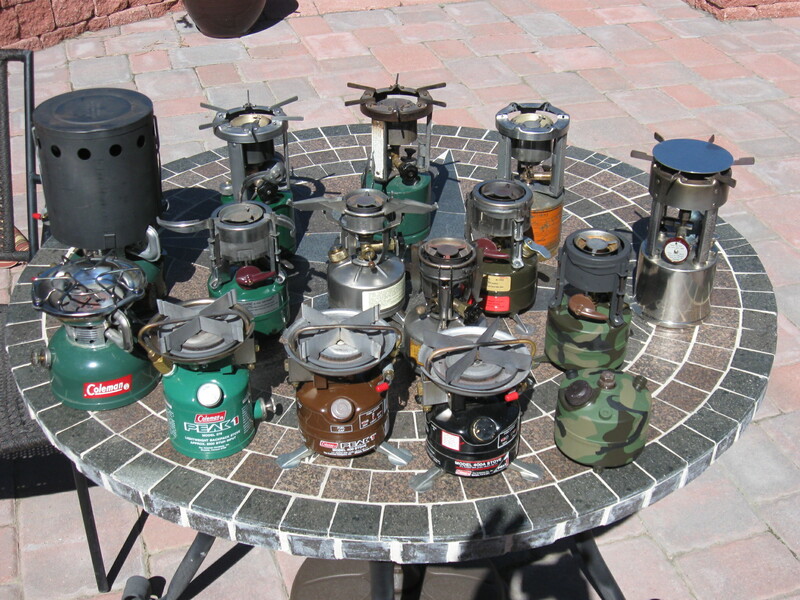 Note that the nickel-plated brass stove on the right is Coleman’s post-war “GI Pocket Stove” version of the WWII stove (it wasn’t used by the military, nor would that thing fit in any of my pockets). The nickel finish was also present on their original 1941 stove for the military. In 1942 they moved to painted steel tanks. Next up are the Prentiss-Waber M1942 stoves, both made in 1945. Some people call these the Mountain Stove as it was used by the US Army’s 10th Mountain Division in WWII. Many people comment that this was the best single-burner stove. I’m not completely sure I agree as I have a strong dislike of the check valve, but the stainless steel everything, light weight, pre-heat cup,separate needle-valve control and compact size makes it up among the best for liquid-fuel stoves of this style – in my opinion. I have a bunch of these M1950 stoves. 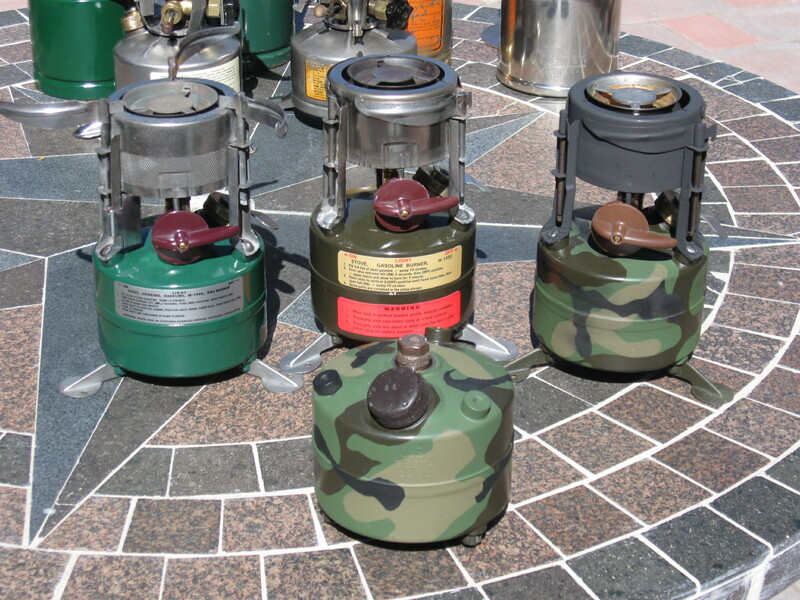 The green one is a 1951 Coleman, the darker stove is a 1963 Rogers, the camo tank stove is a 1965 Rogers and the camo tank, which I’m using as a spare fuel can is a 1981 Fiesta. I custom made a fuel cap and a valve plug just so I could convert some stove tanks to fuel cans. I still have more complete stoves to work on and some tanks I’ll likely make into spare fuel tanks. Also note that the valve knobs were made by be using the techniques mentioned in an earlier blog. Old Coleman Parts is selling the reproductions here: M1950 Valve Knob. I have two Coleman 502 stoves. The black can-looking thing is called a heat drum, hand warmer. These are nice stoves, however their larger size means I wouldn’t take them on backpacking trips. 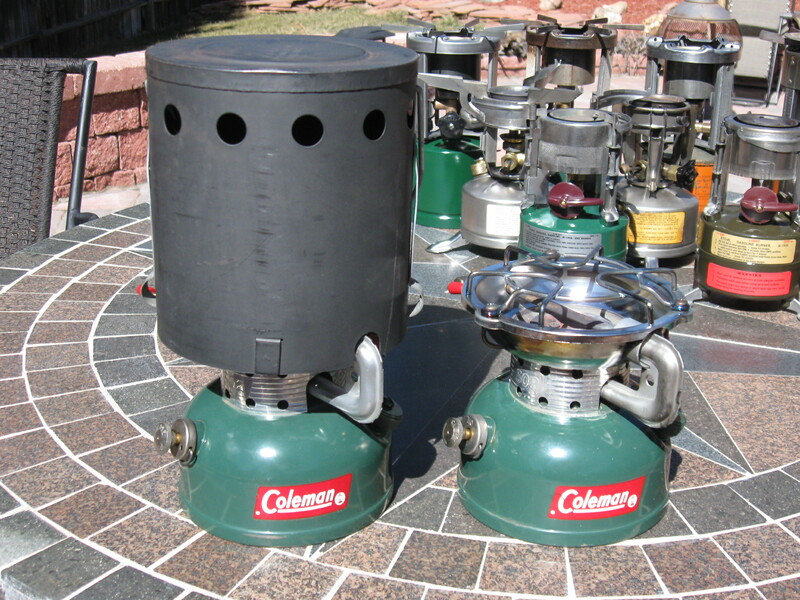 I have three of these more modern stoves from the 1970’s and 1980s The green Coleman 576 was made in Canada. That black 400A is my backpacking/canoe-trip workhorse stove. Best is pretty subjective, and I don’t own any of the stoves made in more recent years, but I still like my Coleman 400A stove. 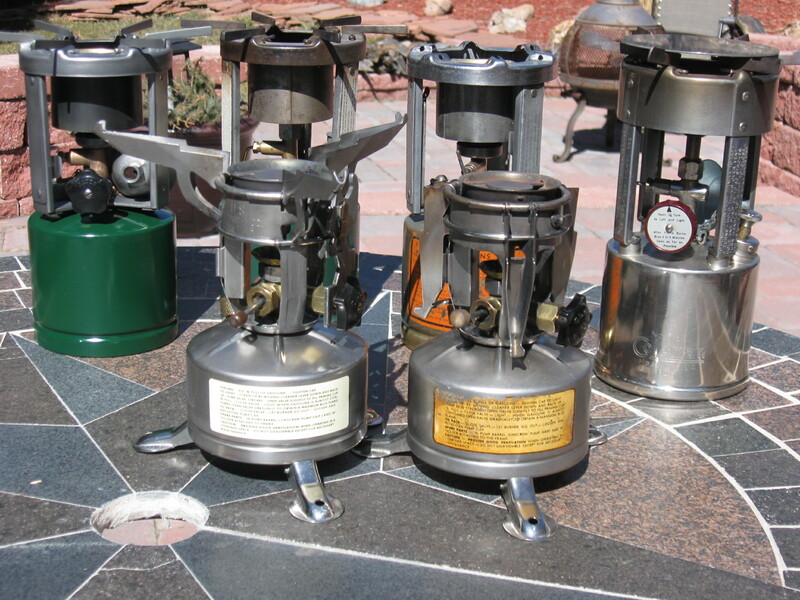 I like it’s needle-valve control, which was removed by Coleman on subsequent models, and in my opinion was a huge mistake as the needle-valve control allowed the user to cook on these stoves (you can see this on some of my previous blog posts). Without the separate needle-valve control the stove works best as a boiler (Coleman Feather 400s and 442s are missing this separate control). I like to use my stove for cooking as well as boiling water, which is why I favor the 400 and 400A stove over most all others. I like the check-valve design which makes it more reliable and safer than the M1942 and M1950, it has a separate needle-valve control which makes it more than a boiler, it has a single complete unit design, which I prefer over the MSR-style separate tank/pump/fuel-tube designs. The newer fuel canister stoves have some issues lighting up in cold weather as a man who owns a Jet-Boil (I like the Jet-Boil a lot) explained to me a few weeks ago. He tried using it while on snow-sledding outing and the stove just wouldn’t work, so he went out and bought a MSR Dragonfly which worked better. The only thing the 400A stove lacks is a preheat cup, which you can over come in sub freezing temps, by bringing some preheat paste. And, gathered together . . .
As far as collector hobbies go it is relatively inexpensive, although, because I really plan to use all of them I don’t necessarily consider myself a collector. Consider that I saw a 1942 or 1943 Coleman 520, new-in-box (it really was pristine, WOW!) sell for about $400 on ebay while the one I own was $28. I paid half that ($15) for my 1941 American (AGM). They’re just kind of interesting to learn about and fix up to working condition once again. This entry was posted in Stoves and Lanterns and tagged 400A, AGM, American, Backpacking, Coleman, M1941, M1942, M1950, Prentiss Waber, Stoves.